Starting in Troy, Montana in northwest Montana, the route follows US Highway 2 just east of Troy to Highway 56 / Bull Lake Road. Turn right / south (it is the only direction you can go) onto Bull Lake Road. Bull Lake Road is about 36 miles long and dead ends at Highway 200. Turn right / west onto 200, toward Idaho. Continue along 200 for 47 miles into Idaho to the junction with Highway 95. Here, you can take a quick stop (go straight at the junction of 95) off of the loop and go to Sandpoint, ID for some good restaurants or amenities. Or you can continue on by turning right / north onto Highway 95. Continue on 95 for 35 miles to the junction with Highway 2. Turn right / east on Highway 2 toward Troy. It is about 32 miles back to Troy, Montana. This is a great day loop or overnight. Roads are best from May 15 through September, if the weather holds out. You can call the Golden Nugget Tavern to find out what the roads are like in the Troy area (406) 295-4433. Lots to see as you follow along the Kootenai River, Bull Lake River, then the Clark Fork River, and finally alongside Lake Pend Oreille. Curving roads with mountains on all sides. 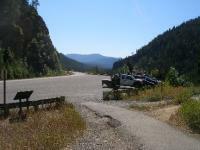 Best stopping points / side trips are Ross Creek Cedar Grove on Highway 56 (side trip) and the Moyie Springs Bridge overlook on Highway 2 near Moyie Springs, ID. Best of both worlds: some straight sweeping curves and some tight curves mainly following the river valleys. Some hills with the largest near the Yaak River outside of Troy, MT. Many campgrounds, easy access to gas and groceries. A few good bars and restaurants. Best biker bars on the route are Home Bar (Troy, MT), Halfway House (Highway 56), Toby's Bar (Noxon, MT right off the loop), and the State Line Bar on Highway 2 between MT and ID. Good restaurants are Floating Restaurant in East Hope, ID, Eichart's Pub in Sandpoint, ID (just off loop), Fiesta Bonita in Ponderay, ID, Golden Nugget (off loop, just up Yaak River Road / 508 west of Troy, MT). Casino and Farmer's Market in Bonners Ferry, ID. Dorr Skeels Campground on Highway 56 is good, and Bull Lake public beaches are also nice. on July 12, 2018 0 out of 0 members found this review useful. Took this ride in early July. Saw a deer, an elk, and five goats in the road at different locations between Noon and troy. Goats apparently don't move. Good ride. on July 29, 2015 0 out of 0 members found this review useful. on January 2, 2012 0 out of 0 members found this review useful. This is a great ride. We ride 2 up and make this run atleast once a year great people ,good food,every type of riding you could ask for! on March 2, 2010 0 out of 0 members found this review useful. Great day loop ride. Good scenery and acceptable traffic levels. Beware local in-town speed limits as they do have local cops enforcing them. People are for the most part friendly and you will run into lots of other riders during the season (May-Sept).